For your signed copy please send your name, address, and a check for $ 25.00 ($ 4.95 off of list price and shipping is included in the US!) to Charles Sthreshley, 402 Duncan St., Ashland, VA 23005. If you live outside the USA, please e-mail me at Wildriverrunner@gmail.com so that I can calculate the shipping. This book may also be purchased from Schiffer Publishing, Amazon.com, and many online retailers both domestic and international that are equipped to take credit cards and foreign money. Concrete is a fascinating material in the hands of a creative person. The Direct Concrete Technique illustrated in this book empowers anyone to make furniture or sculpture by hand without molds or forms. The key to this method is the use of a steel armature covered with wires. 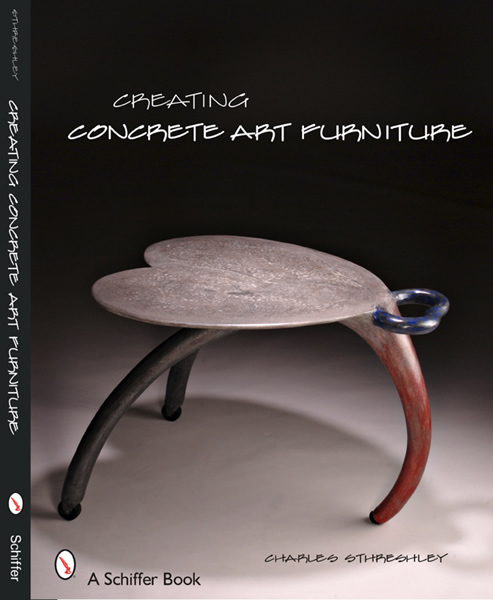 With 296 vivid color photos and precise text, you can learn the steps necessary to use concrete as a fine art material to create innovative and imaginative furniture, from initial concept and creation of the armature to the application of concrete and finishing the artwork. Bold and elegant designs of lightweight curvilinear elements can be fashioned with this method. The advantages of concrete and the direct technique are numerous and the results are immediate and durable. The skills to make free-formed objects of concrete are easily mastered and creative opportunities abound throughout the process. A furniture gallery is provided for further inspiration. Sthreshley is also featured in more books.